The First World War Victory Medal of Major Bertram Lawrence HERDON has been returned after being missing for nearly 100 years, just in time for the Centenary of Remembrance Day. From Krakow in Poland to Spain, then around the world to Australia. This missing medal awarded to an Englishman serving in the Indian Army truly has a global association. The medal return took place at the ANZAC Memorial in Sydney Australia …. a long way from where Bertram served during the Great War. This medal was returned in conjunction with the wonderful genealogy website Ancestry.com and this medal return really was an international affair. Please see our blog in the ARTICLES OF INTEREST section of the Medals Gone Missing website. To have a listing on the Medals Gone Missing website is to greatly improve your chances of having that lost war medal of an ancestor, returned to your family. Undoubtably, Ken SMITH of New South Wales in Australia will attest to that. His great grandfather Charles Gilbert SMITH departed Australia's shores for service during the Great War of 1914-1918. As such, his full medal entitlement consisted of the British War Medal and the 1914-1918 Victory Medal. Unfortunately, these war service medals went missing. 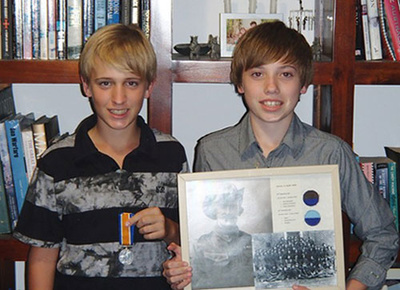 In May 2011, Ken SMITH of New South Wales submitted a listing for his great grandfather's missing war medals. Two years later in July 2013, Medals Gone Missing located one of the medals being offered for sale on eBay and we made immediate contact with Ken. Undertaking the bidding himself, Ken was successful in the auction which saw 28 bids. Well done Ken! I would like to once again thank you for your help in locating the British War Medal that belonged to my great grandfather (Charles Gilbert Smith 4409). The medal has arrived back to the family and we are all thrilled beyond words. I’ve attached a photo of two of Charlie’s great, great grandchildren with the medal, and I think that the smile on their faces says it all. To be honest, I never really expected that we would find any of Charlie’s items from the war, and to actually be able to hold this has made us all very happy indeed. I can say with some certainty, that this medal has not been seen in the family since before Charlie’s death in 1927. So it has been missing for (at least) eighty six years. The only other certainty is that without the help of Medals Gone Missing, this medal would never have been found. ..... Let’s hope we can locate the Victory Medal that is still out there too. Without your help we would not have known about the auction and it would been lost again for years. Incidentally, the medal is in perfect condition!